Right before Thanksgiving,my friend Chrissy asked me to make cupcakes for her daughter Liza’s birthday. Chrissy said Liza liked zebras, mustaches, Paris, Yogerette chocolate bars, and hates fruit and her favorite colors are black, white and blue. I can handle all of that! Luckily I had just enough black and white zebra cupcake liners on hand from Sweets & Treats Boutique to make these cupcakes and used them as a starting place for the theme. Chrissy also showed me a photo of a cake with alternating white and black baked in the cake to make the zebra pattern so I knew I definitely had to incorporate that into the mix. 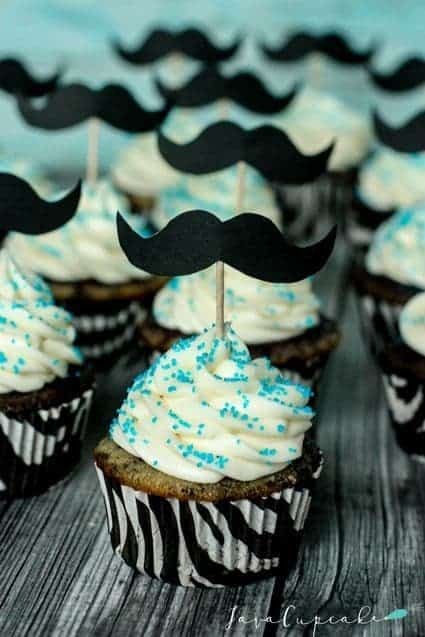 But how could I incorporate mustaches into the cupcake? 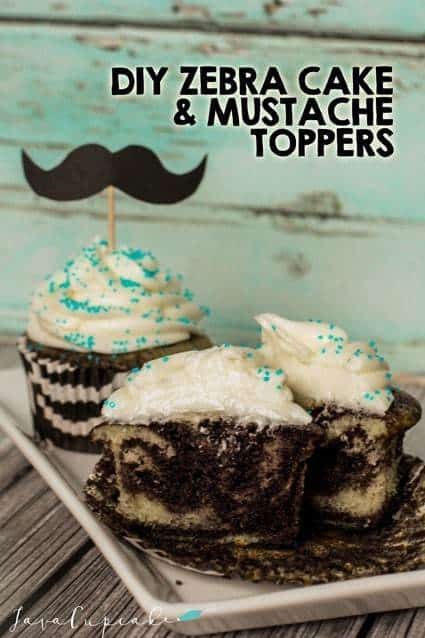 Oh, right… toppers! At first I thought I may be able to commission another friend of mine who works with fondant to make 3D toppers for me. But when we couldn’t find a mold, I decided that paper toppers would be just as cute and super simple to make. 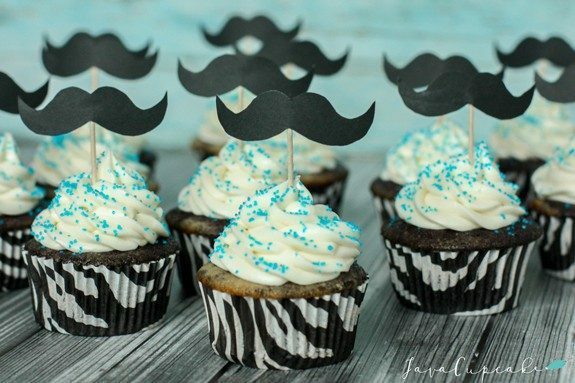 These Mustache Cupcake Toppers take just a few minutes to make and add a cuteness factor to the cupcakes that is undeniable! For the cupcakes, I used this vanilla cake recipe and a basic almond flavored cream cheese frosting. To create the zebra effect in the cupcakes, I used this technique. 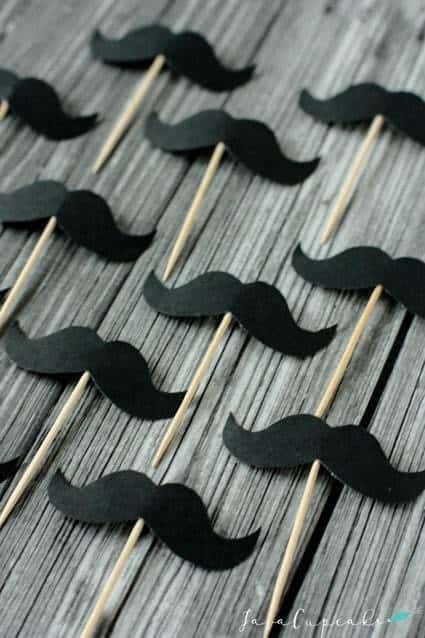 Print the DIY Mustache Topper Template. Using the glue stick, glue the template directly onto the black card stock or construction paper. This will help give the topper stability. Carefully cut out each mustache. 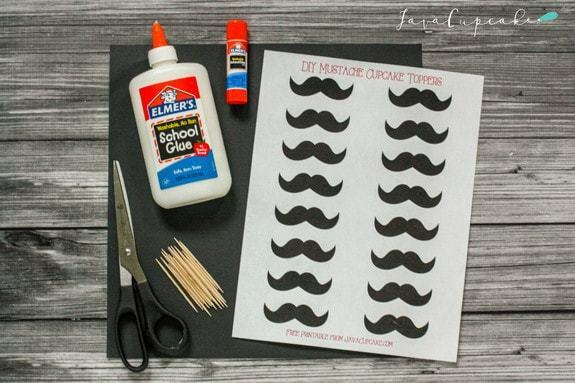 Using the liquid glue, place a small dollop onto the printed side of each mustache and set the end pick/stick into the glue. Make sure the stick does not poke over the top. Let the glue dry completely before inserting into the cupcake. I “mustache” you how you got so creative?!?! I love the mix of black and white and the cute little toppers! I like the idea of putting a mustache as a design! Very creative and nice to see:).